All eyes and ears will be anticipating this film’s release and its aftermath, especially after the release of its trailer. But the songs aren’t just hot enough in the airwaves to take over the top spot. MAARI and PULI and VAALU and THALA, Oh My! Puli is already one of the highest ever! Kabali’s first look along with Puli? Is Ilayathalapathy Vijay seeking the Superstar title ? 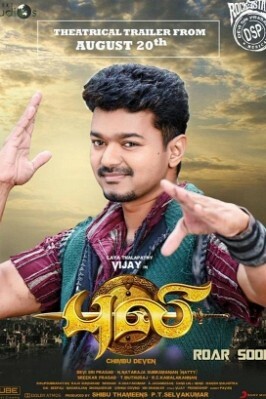 No release plans for Vijay yet! A different Udhayanidhi this time! Puli aka Puli is a Tamil movie with production by Selvakumar, Shibu K. Thameen, direction by Chimbu Deven. The cast of Puli aka Puli includes Hansika Motwani, Kiccha Sudeep, Nandita, Prabhu, Shruti Haasan, Sri Devi, Vijay.